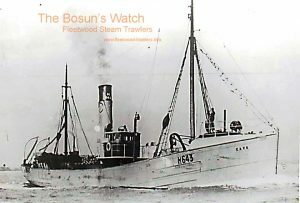 8.8.1899: Launched by Cook, Welton & Gemmell, Hull (Yd.No.237) for Roberts & Ruthven Ltd (64/64), Grimsby as HORUS. 15.9.1899: Registered at Grimsby (GY691). 9.1899: Completed Robert W. Roberts, manager). 27.4.1916: Captured by German armed trawler in North Sea and taken to Wilhelmshavn. Renamed KRIEGSHILFE. 1919: Returned and reverted to HORUS (GY154). 9.1921: Sold to Boston Deep Sea Fishing & Ice Co Ltd (64/64), Boston. 20.9.1921: Grimsby registry closed. Registered at Boston as DALBY (BN161). 5.1922: Sold to Pogson, Symonds & Co Ltd (64/64), Grimsby. George William Pogson, Cleethorpes appointed manager. 19.5.1922: Vessel mortgaged (64/64) to George William Pogson, Cleethorpes for the sum of £1000 with interest at 6% (A). 5.10.1922: Registered at Grimsby (GY154). 26.10. 1922: Vessel mortgaged (64/64) to The National Provincial & Union Bank of England Ltd, London (B). 5.10.1922: Registered at Grimsby as DALBY (GY154). 27.5.1925: Sold by mortgagee under mortgage (B) to Bowden Ramster (64/64), Fleetwood. 28.5.1925: Vessel mortgaged (64/64) to Midland Bank Ltd, London (C). 30.5.1925: Bowden Ramster designated managing owner. 15.6.1925: Bowden Ramster appointed manager. 26.6.1925: Sold to The Dalby Steam Fishing Co Ltd (64/64), Fleetwood. (Bowden Ramster, manager). 26.6.1925: Vessel mortgaged (64/64) to Midland Bank Ltd, London (D). 10.3.1929: Off the Isle of Man (Sk. Radford), responded to distress from steam trawler SAPPHIRE (D18) disabled with trawl fouling propeller. Connected and delivered Douglas where propeller was cleared. 30.10.1937: Landed deckhand at Douglas, IoM with injuries sustained when gear parted. 3.1939: Sold to Thos. W. Ward Ltd, Sheffield for breaking up at Preston. 29.3.1939: Grimsby registry closed “Ship broken up”. (Discharge of mortgage (D) not registered until this date). 14/05/2012: Page published. 5 updates since then. This entry was posted in Steam Trawlers and tagged Dalby SFC on May 14, 2012 by Fred Smith. 8.7.1902: Launched by Cochrane & Sons, Selby (Yd.No.303) for James H. Collinson, Hull (managing owner) as CAVE. 17.9.1902: Registered at Hull (H.643). 11.1914: Requisitioned for war service as a minesweeper (1-12pdr) (Ad.No.389). 30.12.1916: Additional 1-6pdr HA fitted. Northern Patrol. 23.10.1923: Transferred to Exors of late James H. Collinson – Harry Collinson, Henry Hewett & Jesse Spring (64/64 joint owners), Hull. 30.1.1924: Connected with steamer ELVENES (3899grt/1901) disabled with damaged rudder and delivered Stornoway. 3.6.1924: Awarded £2600 by Admiralty Court for assistance to steamer ELVENES. Hull. 10.10.1924: Sold to Harry & Stanley Collinson, Hull. 25.1.1930: When entering Kirkwall, Orkney ran aground. Worked the engine, came afloat and berthed: no damage. 10.8.1933: Sold to The Dalby Steam Fishing Co Ltd, Fleetwood (Bowden Ramster, manager). 2.12.1935: When entering Stornoway, Isle of Lewis ran aground and held fast. 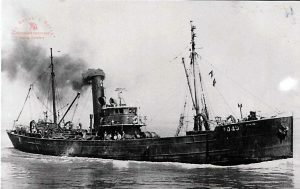 Steam trawler TRANSVAAL (FD381) connected and refloated; berthed for survey. 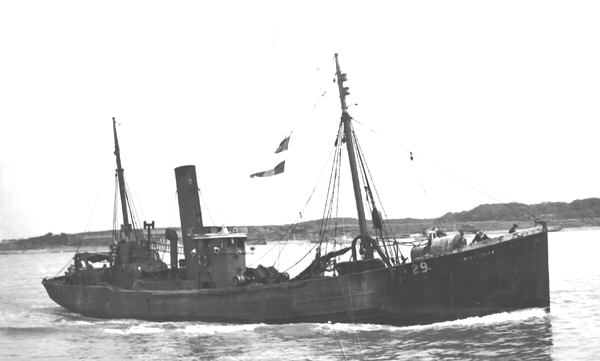 16.3.1937: Homeward from the fishing grounds in very heavy weather when 30 miles west of Dhu Hearteach shipped a heavy sea and three crew swept across deck and dashed against ironwork. John Randle sustained head injuries and Tom Garwood and John Snasdall body injuries. 17.3.1937: Put into Oban for medical assistance; all three taken to West Highland Cottage Hospital, Randell was unconscious and his injuries serious. 6.8.1943: Sold to J. Bennett (Wholesale) Ltd, London (William A. Bennett, manager). Landing at Fleetwood from Faroe and Iceland grounds. 30.11.1945: Insured value £14,000; for 1946 proposed same. 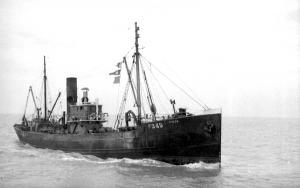 21.10.1946: Sold to William Flockhart, Newhaven, Edinburgh & others (trading as Ocean Fishing Co, Newhaven) (George A. Ward, manager). 7.11.1947: Sold to Joseph Croan, Edinburgh. 12.8.1948: Sold to Den Fishing Co Ltd, Dundee (Harry McFarlane, Broughty Ferry, manager). 1950: Sold to BISCO and allocated to P. & W. McLellan Ltd, Bo’ness for breaking up. 3.5.1950: Arrived Bo’ness from Granton under own power. 23/01/2009: Page published. 10 revisions since then. 20/08/2014: Broken image link repaired. 30/12/2017: Removed FMHT watermark from image. This entry was posted in Steam Trawlers, Steamers (Picture) and tagged Dalby SFC on January 23, 2009 by Fred Smith. 26.2.1898: Launched by Cook, Welton & Gemmell, Hull (Yd.No.204) for The City Steam Fishing Co Ltd, Hull as the CITY of HULL. 26.5.1898: Registered at Hull (H396). John A. Laverack designated manager. 27.5.1907: Sold to Dublin Steam Trawling Co Ltd, Dublin. 2.1908: Registered at Dublin as DEAN SWIFT (D335). Arthur Richardson, designated manager. 14.1.1911: Arrived Dublin with crew of Liverpool owned, Glasgow registered steamer TURTLE (146grt/1893), Annalong for Birkenhead, cargo potatoes, which foundered off Carlingford Lough, Co. Down. 1915: Fitted with new deck. 1922: Company restructured as Dublin Trawling, Ice & Cold Storage Co Ltd, Dublin. Arthur Richardson designated manager. 1926: Sold to Mrs J. M. F. A. Nierinck, Blackpool. Frank Thornley, Fleetwood designated manager. 1928: Sold to Thornley & Co, Fleetwood. Frank Thornley designated manager. 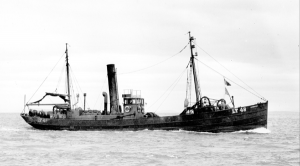 15.7.1928: Responded to distress from steam trawler HIDDENITE (FD180) ashore on rocks in Sound of Islay close to Port Askaig. In bad position and listing to starboard at low water. At high water connected and attempted to refloat but unsuccessful. 16.7.1928: Again attempted to refloat but without success. On arrival of a Glasgow tug, left the scene for Fleetwood. 1928: Sold to Dalby Steam Fishing Co Ltd, Fleetwood. 25.5.1929: Registered at Fleetwood (FD29). Bowden Ramster designated manager. 21.9.1934: Sidney Mungay lost overboard. 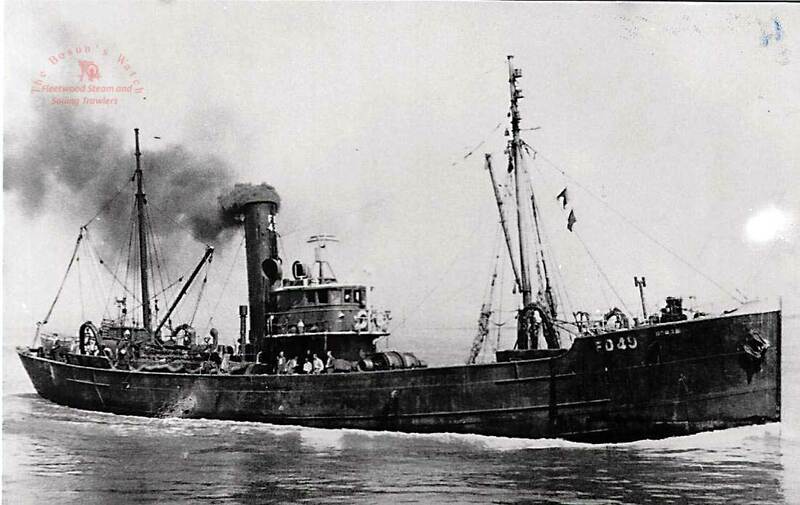 1939-46: Out of Fleetwood for much of war, fishing home waters. 24.5.1943: Typical landing. 243 kits, hake-99, cod/codling-24, haddock-4, whiting-26, plaice-12, ling/coley-35, roker-5, gurnard-8, dogs-30. 4.2.1957: Sheltering in Ramsey Bay (Sk. Jack Randles) assistance requested by ALCMARIA (LT48) (Sk. 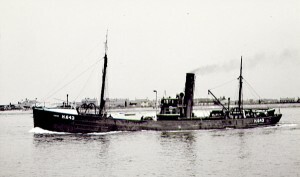 Leslie Hatcher), disabled off Maughould Head with boiler trouble. Steamed 40 miles in rough weather to arrive at the drifting ALCMARIA 11 miles NW of Morecambe Bay Lightship. At 6.00 pm. attempted to connect but line parted. At 8.30 pm. Sk. Hatcher sent SOS and at 10.00 pm Barrow lifeboat launched, also answered by RED SABRE (LO71) (Sk. Jim McKernan) outward for fishing grounds. 5.2.1957. At 3.00 am with Barrow lifeboat in attendance, after several attempts with rocket and barrel RED SABRE connected, but line carried away and fouled propeller. With Barrow lifeboat still in attendance and in moderating weather, Sk. Randles, connected at 5.00 pm. and towed to Fleetwood arriving just after midday. 20.1.1959: Sold to Hammond Lane Foundry Ltd, Dublin for breaking up. 27.1.1959: Delivered Dublin from Fleetwood under own power. 21/01/2009: Page published. 5 revisions since then. 25/01/2019: Removed FMHT watermark and updated information. This entry was posted in Steam Trawlers, Steamers (Picture) and tagged Dalby SFC, Thornley & Co on January 21, 2009 by Fred Smith. 18.11.1929: Launched by Smith’s Dock Co Ltd, South Bank-on-Tees, Middlesbrough (Yd.No.895) for Neale & West Ltd, Cardiff as NODZU. 12.1929: Completed (Morley H. Neale & Joshua S. Neale, joint managers). Registered at Cardiff (CF22). 1.9.1939: Requisitioned for war service as a minesweeper (P.No.FY.659) (Hire rate £142.13.3d/month). 1956: Neale & West Ltd closed their Cardiff base; vessels for sale. 5.1956: Sold to Dalby Steam Fishing Co Ltd, Fleetwood (John B. Ramster, Cleveleys, manager). 5.1956: Registered at Fleetwood (FD49). 6.1959: Sold to BISCO and allocated to Thos. W. Ward Ltd, Sheffield for breaking up. 4.11.1959: Delivered Preston from Fleetwood under own power. Fleetwood registry closed. This entry was posted in Steam Trawlers, Steamers (Picture) and tagged Dalby SFC on January 18, 2009 by Fred Smith.